The Monaghan family motor business was first established in Moylough Co Galway in 1951 by Tom and Phyllis Monaghan. At our premises on the Tuam Road we offer the full range of Skoda new cars, over 60 used cars for sale and a fully equipped car service department. A family run business, serving the West of Ireland for over 20 years, we provide competitive motor finance, a fully stocked Skoda parts department and body repair facility. We can cater for all your motoring needs and relish the opportunity to help with your enquiry. Back then there was very little money and the local community helped to build the premises in return for repairs to their bikes and cars. Through hard work and long hours they were soon able to afford a larger property directly across the road. 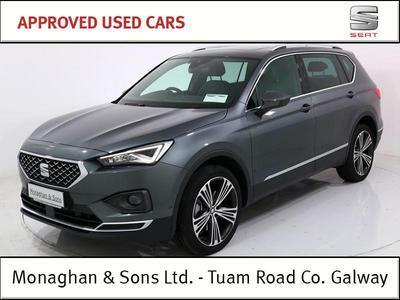 Tom & Phyllis bought their first Property in Headford in 1967 and since then, Monaghan & Sons Ltd have become firmly established as one the premier Motor Dealers in the West of Ireland, with Branches in Galway and Castlebar. By 1978 both Joe and Ger were working full time in the business and it was decided to buy John Cunningham's garage. This premises was expanded and a filling station built on an adjacent site. Monaghan & Sons got the Mazda Franchise here in 1989 and also bought a site on the Tuam Rd. in Galway City in the same year. Mazda moved to Galway in 1992 and Skoda started selling in Headford in 1993. Jim Bartley (Bella Doyle from Fair City) being presented with a Forman at Ashford Castle. Bob O'Callaghan & Eddie Thornton presenting Ger with some Crystal. This was in celebration of Skoda selling more than 1,000 cars in 1998.